Telangana Government Change to The Andhra Pradesh Financial Code Volume – I & II, Andhra Pradesh Treasury Code Volume – I & II and Accounts Code Volume – I & II & III were last updated more than three decades ago i.e., during 1980’s. Enormous changes have taken place since then consequent to the various administrative reforms taken up by the Government, Computerization, Delegation of Powers, Conversion of Non-Banking Sub Treasuries in to Banking, On-line transfer of funds through NEFT / RTGS more importantly due to proposed introduction of CFMS Package. Consequent to the formation of Telangana State and to cater to the changing administrative needs of the Government and as a part of Good Governance there is imperative need to review all the codes and examine them De-nova. It is proposed to Restructure / Modernizing the existing code by entrustment of the task to certain in service officers, experience retired officials duly consulting all the stake holders viz., DTA, PAO, DWA and DSA. Certain Departments like Forest, PWD Departments and also external stake holders like A.G(A&E), RBI, SBH etc., are to be involved in the process. The services of certain identified resource persons are also being utilized in this process. The whole process shall be managed through Centre for Good Governance. 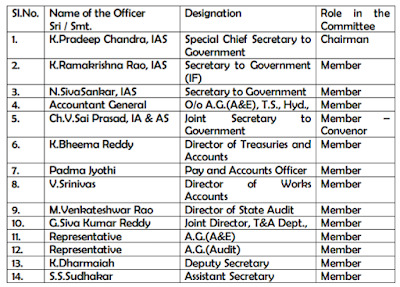 To complete the task of business, re-engineering process and guide the Centre for Good Governance the process, Government hereby forms a Steering / Working Committee to advise and guide in the preparation of New Telangana Treasury Code, with the following officials.